Akai / Roger Linn MPC60 "A MIDI Production Studio in a Box" colour advertisement from page 132 in the February 1988 issue of Keyboard Magazine. Well, we've almost come to the end of 2018, and I wanted to make sure I covered off a few more things before we say hello to 2019. And one of those things is the 30th anniversary of the MPC60. Although it was much earlier in 2018 that the 30th anniversary technically took place, I got lazy. Not uncommon. But I am a little ashamed it took me this long. Now, when I say it was tad longer, I'm talking six or seven months at least. In fact, it was Summer NAMM in June 1987 that it was first introduced to the masses under it's original name, the ADR15 Drum Machine/Sequencer, along with its little brother, the ASQ-10 Sequencer. Unfortunately I wasn't there (along with many others) to witness this event. But, it would only be a short three more months when readers of Keyboard could find the ADR15 info gleaned from Summer NAMM in the Spec Sheet section of the September 1987 issue. "Akai and drum machine pioneer Roger Linn have joined forces to produce the ADR15 Drum Machine/Sequencer and the ASQ10 Sequencer. The ADR15 is both a sampling drum machine and a MIDI sequencer. It features a 320 character LCD, and up to 26 seconds of 120-bit sampling at 40kHz with 18 kHz bandwidth. Samples can be loaded and dumped via MIDI. The unit, which has 16 velocity sensitive pads, is 16 voice polyphonic, and 32 drum sounds can be in memory at a time. Ambience and other effects can be added to the drum sounds. The ADR15's sequencer section and the ASQ10 Sequencer share the same specs. Both sequencers record 60,000 notes in up to 99 sequencers of up to 99 tracks. Sequences can be chained together into 20 songs of 256 steps each. The units sync to MIDI song position pointer, FSK, a quarter-note metronome, or SMPTE, and feature two MIDI ins and four MIDI outs. ADR15: $4,999.95. ASQ10: $2,499.95." And when Keyboard finally came out with there annual Summer NAMM article in the November 1987 issue, it was again given a good deal of real estate in print. Although there was a lot of duplicate info between the Spec Sheet info and the NAMM article info, there was some new info too. Readers learned that it was a redesigning of the Linn 9000 drum machine/sequencer/sampler. We also learned of the context-sensitive help feature, and that the sequencer included a "variety of editing, quantization, looping, and punch-in/out options" and that "changes in tempo and drum mix, panning, and tuning can be programmed into sequences". If you follow the link above, you will find what MATRIXSYNTH rightly refers to in 2014 as "a fascinating bit of synth history". From there you will find a nice synopsis of the history of the ADR15/MPC60 name and a link to a January 2013 bboytechreport.com interview with Mike McRoberts, Akai's product manager for the U.S during the MPC heydays. A fascinating read! That MATRIXSYNTH page also includes a photo of an ADR15 prototype, which unlike the MPC60, had a fixed LCD display and a foam rubber arm rest. Anyways, Akai finally launched the MPC60 in Keyboard Magazine in February 1988 with this advertisement, which would only run one more time in the following month. And then the ad was gone, replaced with a X7000 sampler ad. And this ad only seemed to appear once in Electronic Musician in the May 1988 issue. 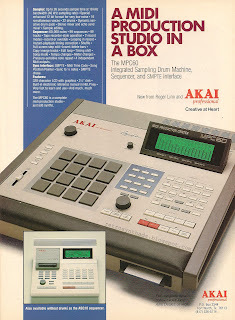 Akai would wait an astonishing 21 months before advertising the MPC again in Keyboard Magazine.